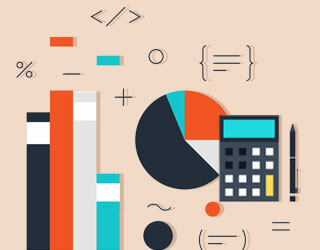 Home » Accounting » Learn Basic Accounting in Less than 1 Hour! 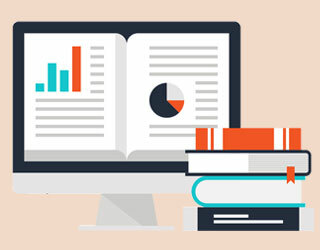 Learn Basic Accounting in Less than 1 Hour – I assume that you are visiting this page because you are interested in learning more about Finance and basic accounting. Perhaps you are an engineer, science graduate or from a non-commerce background struggling to grasp this seemingly complicated concept of finance. Accounting is the heart and soul of Finance. Mastering accounting is not an easy task. I had my fair share of struggles with accounting; those debits & credits I never understood. However, while working at JPMorgan and many other research firms, I was fortunate to develop an intuitive sense of accounting and financial ratio analysis. 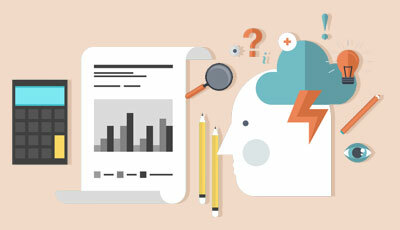 In this article, we learn basic accounting concepts through stories/case studies. It is for those who are new or are struggling with this basic concepts. I bet you will learn the core fundamentals of basic accounting in just 1 hour and without the usage of debits & credits! Following are the list of topics covered in this article. Accounting, or accountancy, is the measurement, processing and communication of financial information about economic entities. Accounting, which has been called the “language of business”, measures the results of an organization’s economic activities and conveys this information to a variety of users including investors, creditors, management, and regulators. Practitioners of accounting are known as accountants. The terms accounting and financial reporting are often used as synonyms. 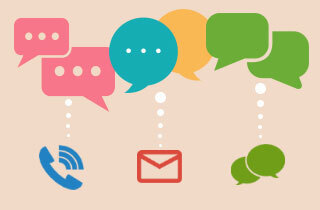 There are three main aspects that are discussed above – measurement, processing and communication. 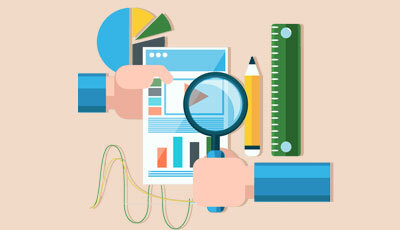 Measurement involves making judgement about the value of the economic transactions, assets or liabilities. The measurement of this economic information needs to be processed and communicated through various forms of accounting forms. What is the purpose of financial statements for finance professionals? To show how the entity has performed (financially) over a particularly period of time (an “accounting period”). The most common measurement of “performance” is profit. It is also important to understand that financial statements can be historical or relate to the future. With this investments, FastTrack Movers and Packers will buy a sturdy, dependable delivery van and inventory. The business will incur expenses in operating the business, such as a salary for Kartik, expenses associated with the delivery vehicle, advertising, etc. For a business like above, there will be thousands and thousands of transactions each year. It will be difficult for Kartik to put all these transactions together in a structured format. In such cases, basic accounting software is very beneficial as they help generate invoices to performing basic accounting entries, prepare cheques, update the financial statements without any additional work. By putting all of these entries into the basic accounting software on a daily basis will result in quick and easy access to desired information and will be helpful for the strategic business decision-making process. 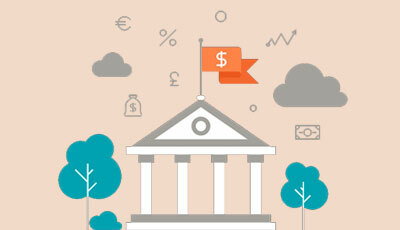 You can also learn accounting from this video course on Finance for Non-Finance Managers. Neeraj point’s out that revenue earned is not same as cash received and the term expenses are more than the cash outflows. If Fast Track delivers 200 parcels in December for $5 per delivery. Kartik sends invoices to his clients for these fees and his terms require that his clients must pay by 15th Jan’2008. How should the Revenues/Sales be accounted for December? 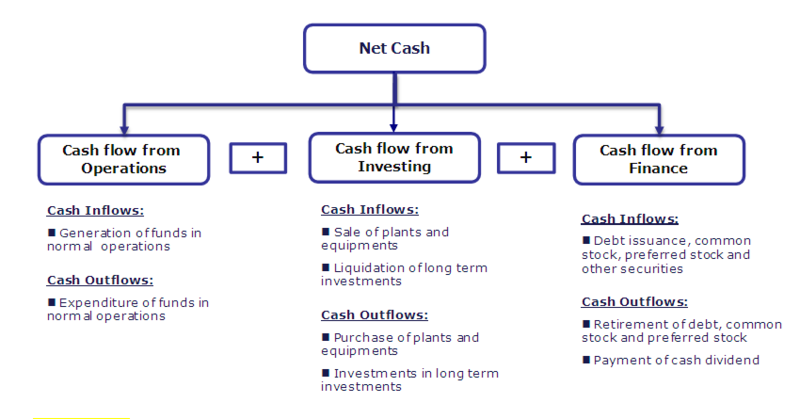 Cash Method – Revenue is recorded only when Cash is received. Revenue earning process i.e. delivery of parcels is completed in the month of December itself. Cash is not received in December. It is only received in the month of January. Under the accrual method of accounting, revenue is recorded when it is earned. In this case, Revenue is “earned” in the month of December as the deliveries were completed during this month. Revenue of $1000 recognized in the month of December as the revenue was earned in this month. What if Kartik followed cash method of accounting? Cash method of accounting is no more followed. However, had the above transaction been recorded on cash basis, Revenues would have been $0 for December and $1,000 for January. All non finance managers, please spend time in understanding the above concept. This one is very important. When Kartik receives 1,000 fees from the client on January, 15th, how should he record the entry when the money was received? Money was not received in the month of December, “receivables will be recorded” as assets for the month of December. However, when Kartik receives the $1,000 worth of payment checks from his customers on January 15, he will make an accounting entry to show the money was received. This $1,000 of receipts will not be considered to be January revenues, since the revenues were already reported as revenues in December, when they were earned. This $1,000 of receipts will be recorded in January as a reduction in Accounts Receivable. Now that we have covered the Revenue or Sales, let us look at the Income Statement expenses. Like the accrual method of accounting, the expenses incurred during December should be documented regardless of whether the company actually paid for the expenses or not. For delivering the parcels, Kartik hires some labors on contract basis and agrees to pay them $300 on January 3rd. Also, Kartik buys some packaging and other supporting material of $100 in December. What is the cost to be accounted for in December? In the case of revenue, we saw the accrual concept of accounting (revenue is recognized when it is earned). Likewise, for expenses, the actual date of payment doesn’t matter; It is important to note when the work was done. In this case study, the parcels were delivered (work completed) in the month of December . This recording of expenses (irrespective of actual payment made or not) and matching it with the related revenue is know as Matching Principle. Other examples of expenses that needs to be “matched” could be Petrol/Diesel for delivery van, advertisement costs, and others. Please note that accrual basis of accounting and Matching Principles are the two most important rules of accounting. You should be in a position to intuitively understand these concepts. To clarify further on these two principles, Neeraj provides another example. This time he uses “Interest Expense” on borrowed loan as an example. In addition to Kartik infusing his own capital in the business, he borrows additional $20,000 from a bank to start his business on 1st December. Let’s assume that the bank charges 5% in interest, to be paid annual at the end of each year. What is the interest expense for the month of December? Please note that interest expense is paid as lump sum amount at the end of the year. Kartik pays the total interest expense of $20,000 x 5% = $1,000. Now think about the Matching Principle concept. If Kartik wants to know his business position in the month of December, should he also record one month of Interest Expense in his income statement? The answer is YES. Kartik needs to match the interest expense to each month’s revenue. Income Statement does not report the cash position of the company. With this let us prepare the Income Statement for the four case studies above. You may be wondering that what is Income Tax. An income tax is a government levy (tax) imposed on individuals or entities (taxpayers) that varies with the income or profits (taxable income) of the taxpayer. I have assumed that Kartik pays Income Tax at 33%. What ever comes after deducting the tax is the Net Income or Profit. Hope you are learning basic accounting and you are pretty clean with the Income Statement. Let us now move forward to the Balance Sheet. Now that Kartik understood the Income statement, Neeraj moves to explain the Balance Sheet. Balance Sheet to gives an idea of what the company owns (ASSETS) and owes (LIABLITIES), as we as amount invested by the Shareholders at a specific point in time. Please note the key word “specific point in time”. This is different from Income statement which is prepared for a period of time (for example Income Statement for the month of December). However, if a balance sheet is dated December 31, the amounts shown on the balance sheet are the balances in the accounts after all transactions pertaining to December 31 have been recorded. Assets – Assets are firm’s economic resources. They are probable current and future economic benefits obtained or controlled by a entity as a result of past transaction or events. As you can see above, Assets are primarily divided into two types – Current Assets and Long Term Assets. 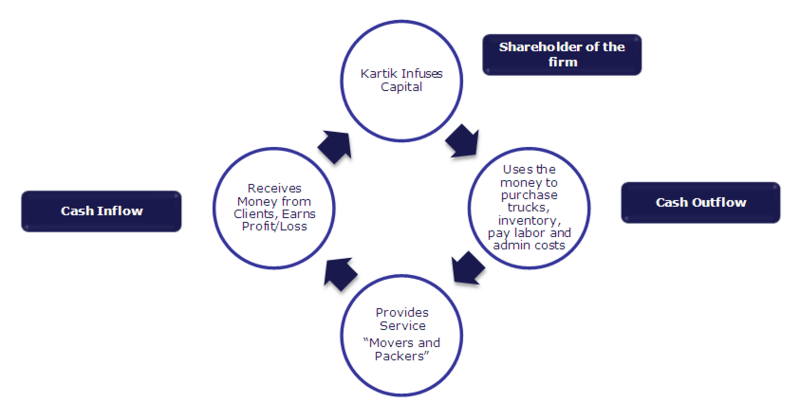 Example of Asset for Kartik’s company could be cash, packaging material and supplies, Vehicle etc. Also, note that Accounts receivables are Assets. Kartik has already delivered the parcels, however, he has not been paid immediately for the delivery. In the near future, amount owed to Kartik’s Fast Track is an asset known as Accounts Receivables. Liabilities – Liabilities are obligations owned to others as of the balance sheet date. They arise from present obligations of a particular entity to transfer assets or provide services to other entities in future as a result of past transaction or events. For example, Kartik took loan from the Bank. This loan is basically a liability which Kartik needs to pay in future. Also, Kartik’s hired few people to deliver the parcels, however, did not pay them (accounts payable), classified as accounts payable. Shareholder’s Equity – The third section of a balance sheet is Stockholders’ Equity. (If the company is a sole proprietorship, it is referred to as Owner’s Equity.) The amount of Shareholder Equity is exactly the difference between the asset amounts and the liability amounts. Within the Shareholder’s Equity section, you would primarily find two sections – Common Stock and Retained Earnings. Common stock represents the initial amount invested in the company by the shareholder. For example, in this case, if Kartik invests a certain amount in his company, this would come broadly under Common Stock section. The second important part is the Retained Earnings. Retained Earnings will increase when the corporation earns a profit. There will be a decrease when the corporation has a net loss. This means that revenues will automatically cause an increase in Stockholders’ Equity and expenses will automatically cause a decrease in Stockholders’ Equity. This illustrates a link between a company’s balance sheet and income statement. This is the most important LINK between the Balance Sheet and the Income Statement. On December 1, 2007 Kartik starts his business FastTrack Movers and Packers. The first transaction that Kartik will record for his company is his personal investment of $20,000 in exchange for 5,000 shares of FastTrack Movers & Packers common stock. 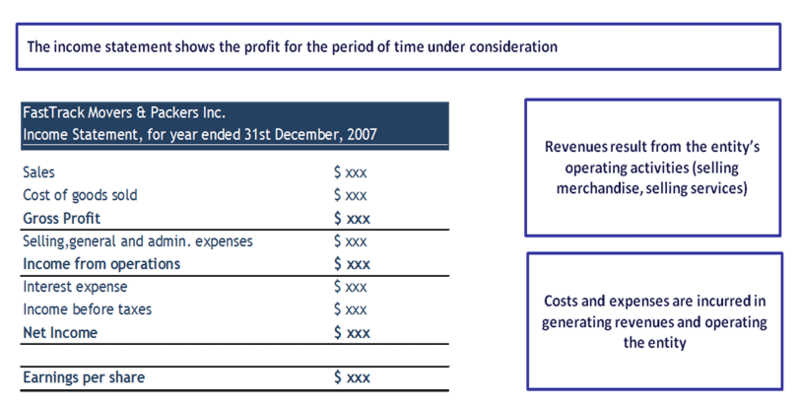 There are no revenues because no delivery fees were earned by the company on 1st December, and there were no expenses. How will this transaction get recorded in the balance sheet? On December 2, FastTrack Movers & Packers purchases a truck for $14,000. The two accounts involved are Cash and Vehicles (or Delivery Truck). How does this transaction get recorded in the Balance Sheet? Kartik also needs to know that the reported amounts on his balance sheet for assets such as equipment, vehicles, and buildings are routinely reduced by depreciation. Depreciation is required by the basic accounting principle known as the matching principle. 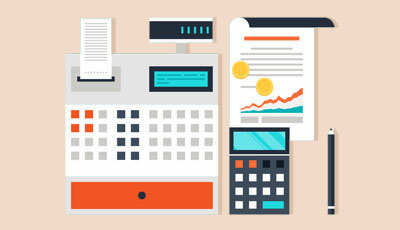 Depreciation is used for assets whose life is not indefinite—equipment wears out, vehicles become too old and costly to maintain, buildings age, and some assets (like computers) become obsolete. Depreciation is the allocation of the cost of the asset to Depreciation Expense on the income statement over its useful life. Fast Track’s truck has a useful life of five years and was purchased at a cost of $14,000. The accountant might match $2,800 ($14,000 ÷ 5 years) of Depreciation Expense with each year’s revenues for five years. Each year the carrying amount of the van will be reduced by $2,800. (The carrying amount—or “book value”—is reported on the balance sheet and it is the cost of the van minus the total depreciation since the van was acquired.) This means that after one year the balance sheet will report the carrying amount of the delivery van as $11,200 (14,000 – 2,800), after two years the carrying amount will be $8,400 (14,000 – 2×2800), etc. After five years—the end of the truck’s expected useful life—its carrying amount is zero. Neeraj brings up another less obvious asset—the unexpired portion of prepaid expenses. Along with the Truck, Kartik takes the insurance coverage for the Truck purchased. The insurance purchase costs him $1,200 for one year. Kartik immediately gives cash of $1,200 to the insurance agent. Fast Track pays $1,200 on December 1 for a one year insurance premium on its delivery truck. That divides out to be $100 per month ($1,200 ÷ 12 months). Between December 1 and December 31, $100 worth of insurance premium is “used up” or “expires”. The expired amount will be reported as Insurance Expense on December’s income statement. Kartik asks Neeraj where the remaining $1,100 of unexpired insurance premium would be reported. On the December 31 balance sheet, Neeraj tells him, in an asset account called Prepaid Insurance. 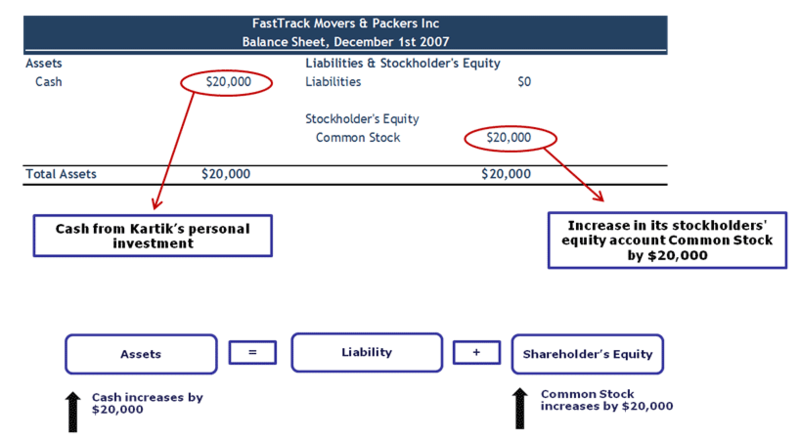 FastTrack Movers and Packers borrowed an additional $20,000 from a bank on 3rd December to invest further in business and the company agrees to pay 5% in interest, or $1,000. The interest is to be paid in a lump sum on December 1st of each year. Kartik keeps an inventory of packing boxes not only to use it for his business but also earn additional revenues by carrying an inventory of packing boxes to sell. Let’s say that FastTrack Movers and Packers purchased 1,000 boxes wholesale for $1.00 each. Kartik learns that each of his company’s assets was recorded at its original cost, and even if the fair market value of an item increases, an accountant will not increase the recorded amount of that asset on the balance sheet. This is the result of another basic accounting principle known as the cost principle. Although accountants generally do not increase the value of an asset, they might decrease its value as a result of a concept known as conservatism. Scenario 1: Assume that since the time when Kartik bought them, however, the wholesale price of boxes has been cut by 40% and at today’s price he could purchase them for $0.60 each. Because the replacement cost of his inventory ($600) is less than the original recorded cost ($1000), the principle of conservatism directs the accountant to report the lower amount ($600) as the asset’s value on the balance sheet. Scenario 2: Assume that since the time when Kartik bought them, however, the wholesale price of boxes increase by 20% and at today’s price he could purchase them for $1.20 each. Because the replacement cost of his inventory ($1,200) is higher than the original recorded cost ($1000), the principle of cost directs the accountant to report the lower amount at cost ($1000) as the asset’s value on the balance sheet. Another liability is money received in advance of actually earning the money.The client has made an upfront payment of $600 for delivery of 30 parcels/month for the next six months. The liability account involved in the $600 received on December 1 is Unearned Revenue. Each month, as the 30 parcels are delivered, Fast Track will be earning $100, and as a result, each month $100 moves from the account Unearned Revenue to Service Revenues. 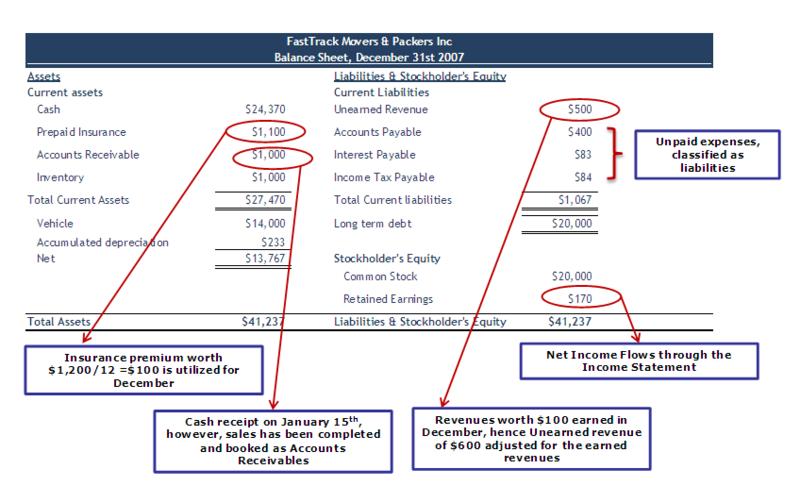 Each month Fast Track’s liability decreases by $100 as it fulfills the agreement by delivering parcels and each month its revenues on the income statement increase by $100. Kartik wants to be certain that he understands what Neeraj is telling him regarding the assets on the balance sheet, so he asks Neeraj if the balance sheet is, in effect, showing what the company’s assets are worth. He is surprised to hear Neeraj say that the assets are not reported on the balance sheet at their worth (fair market value). Long-term assets (such as buildings, equipment, and furnishings) are reported at their cost minus the amounts already sent to the income statement as Depreciation Expense. The result is that a building’s market value may actually have increased since it was acquired, but the amount on the balance sheet has been consistently reduced as the accountant moved some of its cost to Depreciation Expense on the income statement in order to achieve the matching principle. 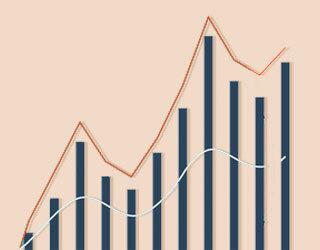 Short-term (current) asset amounts are likely to be close to their market values, since they tend to “turn over” in relatively short periods of time. Neeraj cautions Kartik that the balance sheet reports only the assets acquired and only at the cost reported in the transaction. This means that a company’s reputation—as excellent as it might be—will not be listed as an asset. It also means that Bill Gates will not appear as an asset on Microsoft’s balance sheet; Nike’s logo will not appear as an asset on its balance sheet; etc. Kartik is surprised to hear this since in his opinion these items are perhaps the most valuable things those companies have. Neeraj tells Kartik that he has just learned an important lesson that he should remember when reading a balance sheet. So far in this “Learn Basic Accounting” training, you have understood Income Statements and Balance Sheets. Let us now look at Cash Flow. 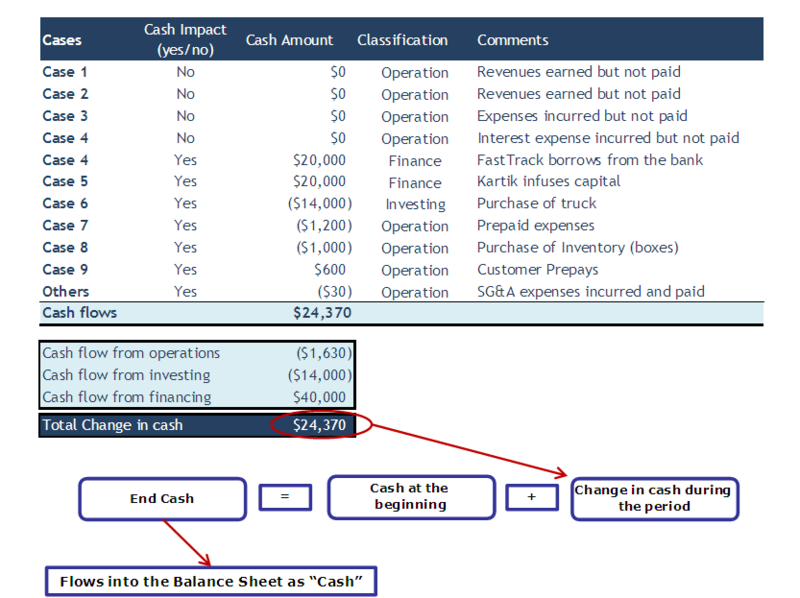 The cash flow statement reports the cash generated and used during the time interval specified in its heading. The period of time that the statement covers is chosen by the company. For example, the heading may state “For one month ended December 31, 2007” or “The Fiscal Year Ended September 30, 2009″. Investing activities: reports the purchase and sale of long-term investments and property, plant and equipment. In short, financing activities involve the issuance and/or the repurchase of a company’s own bonds or stock. Dividend payments are also reported in this section. If you learned something new or enjoyed this post, please leave a comment below. Let me know what you think about this Basic Accounting training. Many thanks and take care. Happy Learning Basic Accounting! Very good Lesson and clear presentation and Many thanks to Dheeraj. Вы прекрасный учитель! Благодарю Вас! I really enjoyed the structure and how synthetic the course was. Thanks for this free accounting course and I’ll be glad to continue learning more other courses. thanks Bartho! Glad you liked this basic accounting course. Many thanks for this great & simple explanation of accounting. I believe this course was an added value for my knowledge of accounting. Thanks for this. A great insight. Keep up the good work. Thanks a bunch Dheeraj…with your streamlined understanding of the subject will it be possible to cover the following topic: shareholders equity & changes due to various corporate actions. THANKS A LOT DHIRAJ, YOUR VALUABLES CONSISTENTLY BOOST & EDUCATE ALWAYS OTHERS. SO NICE. KEEP IT UP. Thanks Neeraj for the encouragement! Thank u for revising my concept. Thanks for providing this valuable information.. Thank you very much for this great enthusiasm to spread such information related to Finance. This is good stuff….keep sending and thanks for exact materials one needs to move forward in securities research. First of all, I would like to thank you very much for the great effort you are making to produce such an informative course and many many more others. I’m coming from a financial and investment background, and I found that “there is no valuation model can value what you are giving”. Your efforts are highly appreciated, and the limit for their value is the sky. 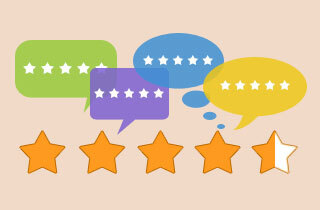 Since you thankfully asked for feedback on this course, I would say that it is a great one. No doubt on this. However, I have 2 points. The first is that the fourth financial statement that is the statement of owners’ equity is not included, which I believe is very important to include and emphasize. This is especially important for new businesses and SMEs in order to highlight on the positive and negative impact of dividend policy, retention, and their impact on growth. The second point is related to the structure, in terms of the sequence of introducing the financial statements. If it comes to me, I would never start with presenting the income statement first. On the contrary, I would leave it to be the last, after presenting the other (3) statements. I would follow this structure: 1 balance sheet, 2 statement of changes in owners’ equity, 3 cash flow statement, and 4 income statement. I believe this structure will give a logical reasoning for the gradual build-up of the financial position from scratch, the cash flow movement at different stages, followed lastly by the impact of the financial performance through the income statement. At the end, I stick to what I previously said, there is no valuation model can value what you are giving. All the respect to persons like you. Hats off. 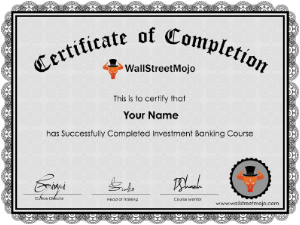 I am an Investment Banking Analyst in Canada. The North American standard which is taught in every modelling/interview prep is 1) Income Statement 2) Cash Flow Statement 3) Balance Sheet. Accurately flows through from 1 to the other. You can add more or change it up if you like but this is the standard. Really appreciate all your posts. It’s hard to get this level of detail on demand without taking a course or something. Keep it up…please! Once again an educating post on accounting. Thanks for this case studies. It was helpful indeed. Thanks Matt for the appreciation! Hi dheeraj nice work. Hope that you will come up with others topics with another story. Plz share some financial modeling cases. Thanks once again…. Thanks Upin. Surely will work on Financial Modeling cases to share. Thank you Dheeraj for this intuitive explanation of accounting with this nice story. I feel more confident now. I am hoping if you could provide some similar case study for practice. Thanks Sonal. will try and put together a case study similar to the one used here for practice.